I hope you enjoy making different flavors as well!!! Mix Matcha green tea powder and sugar very well. Add hot water little by little and mix with Chasen (bamboo tea whisk) or a regular whisk. Strain with a strainer if needed, then cool in the fridge (you can keep it in the fridge for about a week. use before it loses the flavor). Make the shaved ice and serve in a bowl (rice bowl is OK). 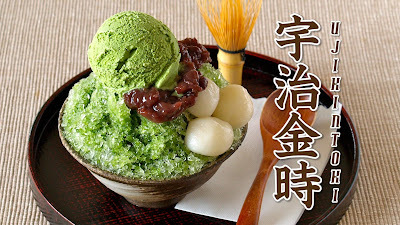 Drizzle with some Matcha syrup, garnish with Tsubu-an and Shiratama Dango, then top with an ice cream of your choice OR condensed milk if you like.